First Class Kitchenette, full size fridge, microwave, cooktop, granite countertops, serving and cooking items. Premium 1GB Wifi (upload and download), 42" or 46" HDTV, DirecTv 100+ channels, dedicated IP gaming ports available. In-room Starbucks Coffee, black-out curtains, Neutrogena bathroom products, hairdryer. Fresh-pressed linen, luxury towels, queen bed, nightstand, dresser, coat closet, recliner. Natuzzi Italian Leather library chair with ottoman, expanded work space area, medium size fridge-freezer unit. In-room Starbucks Coffee, black-out curtains, Neutrogena bathroom products. 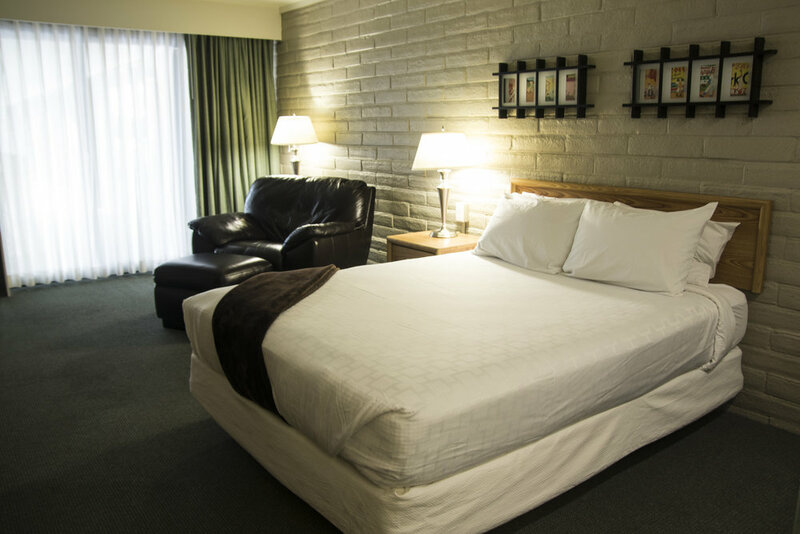 Fresh-pressed linen, luxury towels, queen bed, spacious floor plan. Premium 1GB Wifi (upload and download), 42" or 46" HDTV, DirecTv 100+ channels. Fresh-pressed linen, luxury towels, king bed, nightstand, dresser, coat closet, lounge chair, and desk.